Sunset should have a description for Arizona flagstone: drought-tolerant, best in full sun, tolerates some shade, longer lived in well-draining soils, short-lived in zones that get hard frosts. It’s from the Southwest, so it likes Southwestern conditions, same as the plants. The stones were all freebies leftover from a project where I was working for another designer who had ordered too much stone. To give the stone proper drainage, it’s best to lay the stone in decomposed granite and gravel, but at our house, a rental, we wanted to keep things cheap, so we laid our flagstone in dirt, and it has done okay for us. 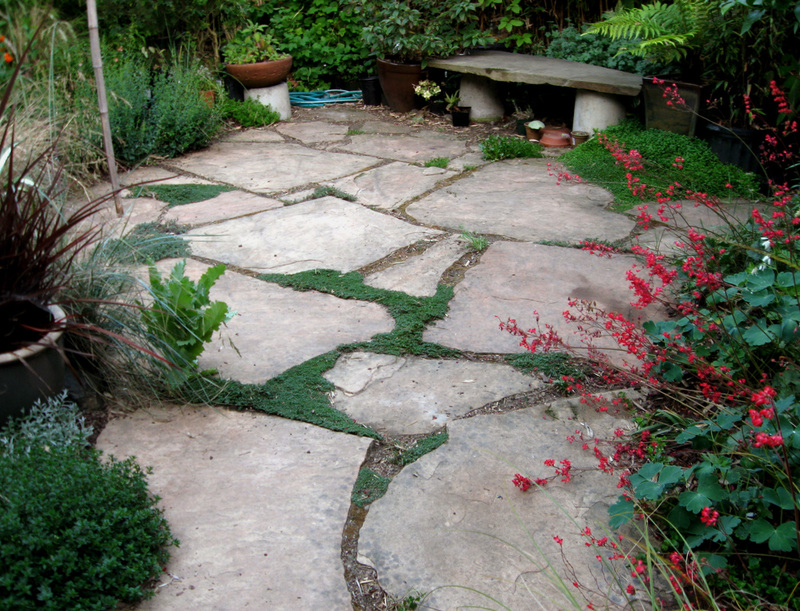 It settled more unevenly than it would in DG, several of the thinner flagstones cracked, and the stone didn’t hold its color, but the graying, mossy flagstone patio fits into the rustic aesthetic of our yard so we’re happy enough. Arizona flagstone tolerates shade and clay soil, it just doesn’t thrive in it. We planted a few different groundcovers in the joints of our patio. The baby’s tears is looking the best these days, during the winter rains. It used to dry out during the summer, but this year we had some pots near it, so it got the water that drained out the bottom of the pots and managed to stay green all year. 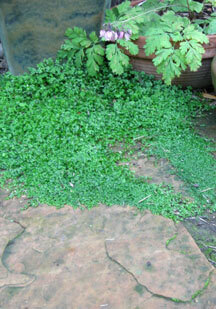 It’s probably our favorite groundcover for damp, mossy areas. Here’s a photo of the patio in May. The baby’s tears is in the back behind the heuchera flowers. This entry was posted on Sunday, January 4th, 2009 at 11:51 am and is filed under flatwork, stone. You can follow any responses to this entry through the RSS 2.0 feed. You can leave a response, or trackback from your own site.